Well, except for the death penalty, which Japan still carries out. But prison terms for less heinous crimes are much shorter than their U.S. counterparts. Call it a quantity vs. quality thing. Japanese prisons are also more austere. Like strict Buddhist monasteries with bars and barbed wire and guards. It was only in 2010 that the statute of limitations was eliminated for murder and crimes that result in the death of the victim. They rarely "lock 'em up and throw away the key" in Japan. Social expectations are supposed to do the rest and they usually do. When Paul McCartney got arrested for marijuana possession at Narita International Airport in 1980, he quickly figured out that conformity was the quickest way out. He only spent a few days in detention, but it's not hard to infer from his reminiscences what life is like in a Japanese prison. I realised from all the movies I'd ever seen and from all the books I'd ever read that the gig in the morning is that you've got to clean your cell. They'd put a reed brush and a little dustpan through the grill in the cell door. I started to realise, "Right, I'm going to get up when the light goes on, I'm going to be the first up, I'm going to be the first with his room cleaned, I'm going to roll up my bed, I'm going to do this, I'm going to do that." You had to clean your room and then sit cross-legged on your blanket. I tend to agree more with the Japanese approach. Aside from the especially grievous offenders, for those criminals who don't pose an ongoing threat to the general public, shorter and more austere makes more sense than "three strikes and you're out." Aside from the death penalty, Japanese law does not have "life imprisonment." The term is muki choueki, or "indefinite servitude." Meaning you may get out sometime. Probably will. Taking away all hope seems a counterproductive way of handling a prison population. I mean, Bernie Madoff is a bad guy who deserves to be punished, but I don't see the point of keeping him in prison until he keels over, beyond simple vengeance. I'd rather see him in an environment where he could make at least a token effort towards restitution. In any case, "low security" prisons aren't the "country clubs" people imagine. 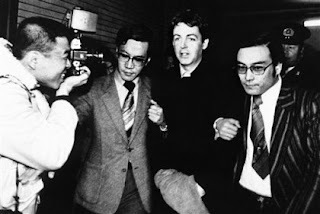 Now, having begun with Paul McCartney's misadventures with marijuana smuggling, I should point out that when it comes to drug use and possession, not just law enforcement, but social mores in Japan are far more exacting than in the U.S.
At the end of the perp-walk, a celebrity in Japan won't get that much worse of a sentence than did, say, Robert Downey Jr. But their careers will be completely wrecked until they've wandered in the wilderness for forty metaphorical years. And so discussions about drug legalization or decriminalization in Japan remain purely hypothetical. On the other hand, getting drunk and even smoking (gasp!) in public won't make you into a social pariah (unless you get drunk and take your clothes off).